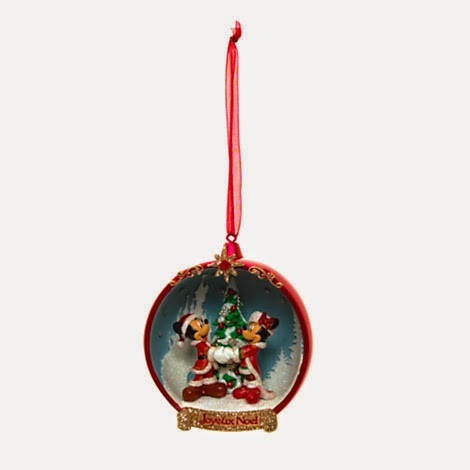 There are some brilliant Disney decorations around this year - I love this one of Lady and the Tramp - but the traditional vibe of this open bauble with Mickey and Minnie decorating the tree just pips it for me. The red and gold adds a lovely opulent feel and I love seeing Mickey and Minnie in their Christmas outfits; it brings back memories of a Christmas-themed Sing Along Songs video I had as a kid. And what better way to celebrate Christmas than decorating the tree? Paperchase always have lovely colourful quirky decorations, but I also really like their more traditional decorations. 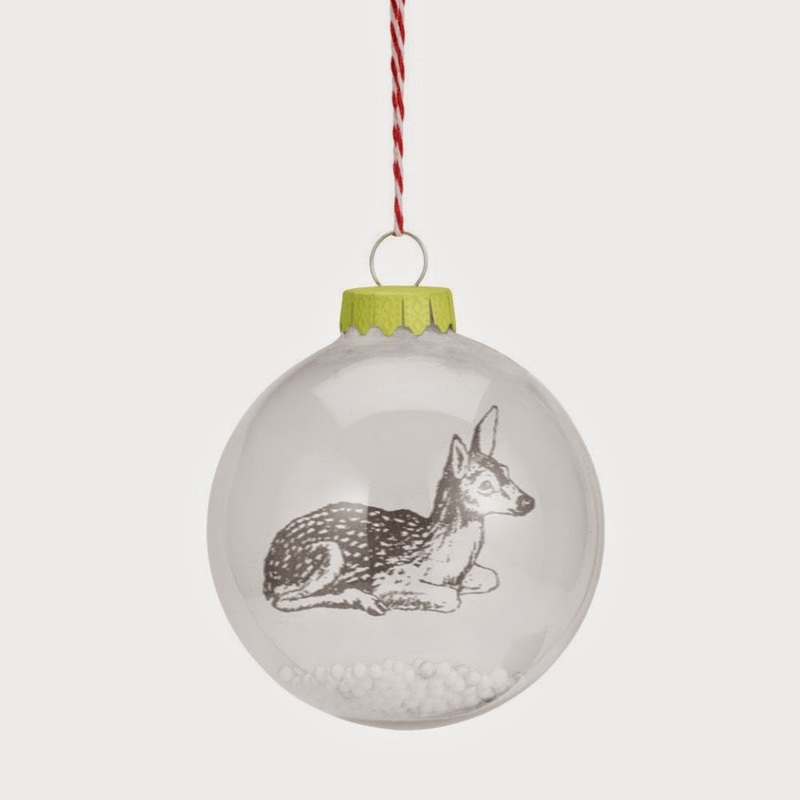 This sweet little deer bauble has a lovely classic look that's set off really well by the candy-cane striped ribbon, and the beads in the bottom to look like snow is a lovely extra touch. If you're the old-school type this would make a great addition to your tree. Their box sets of mini baubles are always really good value too. Because it's Christmas, and there's no such thing as too much glitter at Christmas. 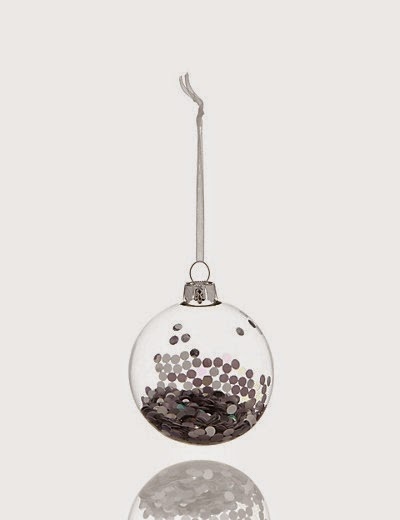 There are loads of these types of baubles around at the moment (Paperchase has lots) but I particularly like this one from M&S. Not only is it cheap as chips at £2 - and on 3 for 2! - but it also has a really classic yet contemporary look. M&S actually has some surprisingly good decorations; if you like your tree to look timeless I'd definitely recommend having a look in there. Of course decorations aren't just for your tree. 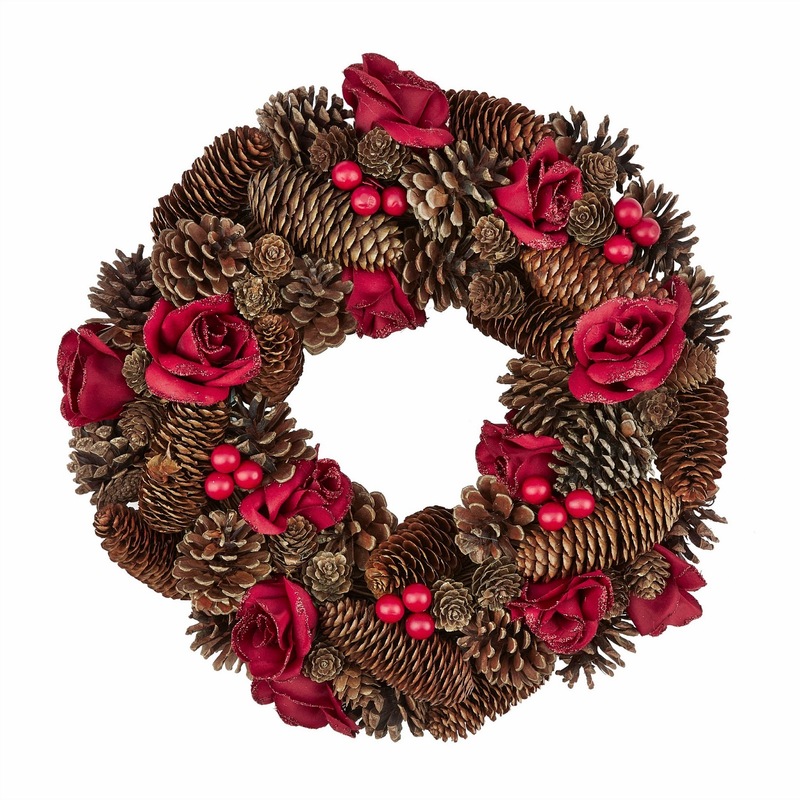 Sadly we don't have anywhere to put this unusual rose and pinecone wreath, but if we did I would definitely be hanging this on my door. It's got a really classic Americana feel about it - if you're like me and into all your classic movies at Christmas then this is the kind of thing you'd see in It's A Wonderful Life or Holiday Inn - but I love the mix of the bright red roses and berries alongside the rustic pinecones. A real statement piece if you like your decorations to be a bit different. I love candles at Christmas - not only do they add a lovely glow to a room on cold dark evenings, the best ones also bring out the wonderful smells of Christmas. 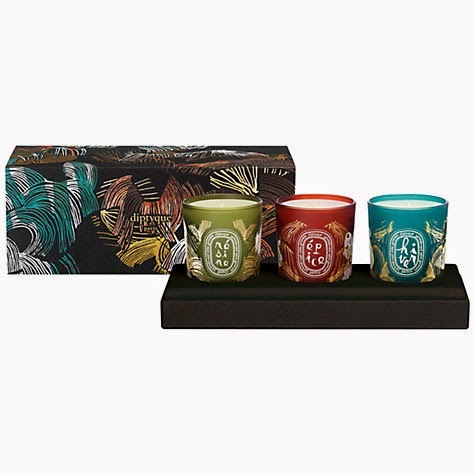 Diptyque are far and away the best for me in terms of throw and longevity, and this set of three is absolutely perfect. I'm particularly keen on the Resine scent which is apparently meant to smell like Christmas trees (the smell is one of the things I miss most about not having a real tree), but they all sound like beautiful fragrances. The colourful frosted glass would also look fantastic dotted around your home on shelves, windowsills or mantelpieces. How do you like to decorate your home at Christmas?